Bellshill Community Council is split over finances with two members claiming the organisation could be facing a debt crisis. Mr Devlin and Mr Gorman say they have been unhappy with financial matters at the community council for some time. They are particularly worried about what they claim is a £2700 bill relating to Bellshill Street Fair, a tab Mr McLeod insists doesn’t exist. 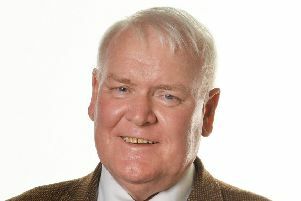 Mr Gorman, a former North Lanarkshire councillor, has been involved with the community council for more than 20 years. He said it’s in a “shambolic” state. The pair questioned why two dance groups were each paid £200 to perform at this year’s street fair when the council is short of money. Last year M&D’s, which has rides and amusements at the street fair, decided to stop a £2000 annual donation to the community council. Mr McLeod said: “The last few years have been very hard and office-bearers have agreed not to take out of pocket expenses, but we are not in debt and M&D’s will be giving us money again this year. Mr McLeod also rejected claims that written financial reports are not presented at community council meetings. North Lanarkshire Council administers and funds community councils, and a spokesman said: “Following a request, a meeting was held with representatives of Bellshill Community Council.